Welcome to the July 18, 2009 edition of the Carnival of Genealogy. The topic for this edition is: How I spent my summer vacation... a favorite summer memory from your youth. You will be well traveled indeed when you read this collection of articles! Lake Louise to Montreal, the cool Atlantic waters in Virginia to Florida, California, and a beautiful mountain lake in northern Idaho... small towns, big cities, and lots of tourist sites in between. These are the memories of the summers of our youth. Come along and take a vacation with us. You'll feel the heat, the cool lake waters, and sand between your toes. We'll ride our bikes as the wind blows our hair and maybe we'll even steal a kiss in the dark... Pour yourself a rum and Coke and pretend you're at the neighborhood soda fountain (we won't tell about the rum ;-) or maybe the local drive-in theater... prepare for a good time! The Carnival's in town! Evelyn Yvonne Theriault presents St-Helen?s Island (L?Ile Ste-Helene) Montreal, Quebec posted at A Canadian Family. M. Diane Rogers presents Carnival of Genealogy - Summer Vacation Lake Louise 1963 posted at CanadaGenealogy, or, 'Jane's Your Aunt', saying, "A little look at a vacation at Lake Louise in Canada, in 1963. All dressed up!" Randy Seaver presents Lazy, Crazy, Hazy Days of Summer ... Our 1950's Vacations posted at Genea-Musings, saying, "Car ides, sightseeing, swimming pools and the beach were the staples of my 1950's era summer vacation trips. Many good memories, and some sunburn too!" in the city of Boston. I'm surprised at how much I still can recall of them some forty years later!" Sharon Klein presents Catching the Travel Bug posted at Genealogy, saying, "Simple summers at home to family road trips...wouldn't it be nice to have 2 months vacation every year again." Terri O'Connell presents Launching vacations and birthday blasts! posted at Finding Our Ancestors, saying, "June 1983, our travels through Florida from Walt Disney World to the Kennedy Space Center." Frances Ellsworth presents Summer Visits and Poignant Memories posted at Branching Out Through The Years, saying, "When Summer visits are more than amusements." Greta Koehl presents How I (Mis)Spent My Summer Vacation posted at Greta's Genealogy Bog, saying, "Summer vacation is a subject kids have to write about as every new school year starts, so it should be easy to come up with a "most memorable" one, right? It wasn't for me. I could recall memorable trips, but none seemed to match up with summer. It was only when I remembered a vacation during which nothing important happened that this subject really struck a chord with me." Ruth Stephens presents The memories of a twelve-year-old posted at Bluebonnet Country Genealogy. Janet Iles presents Janet the researcher: Summer Vacations - Carnival of Genealogy posted at Janet the researcher, saying, "Janet shares memories of summers at Sauble Beach." Linda Hughes Hiser presents 76th Carnival of Genealogy--How I Spent My Summer Vacation posted at Flipside, saying, "Hands down...Stone Harbor, New Jersey. We cut our body surfing chops in that ocean." 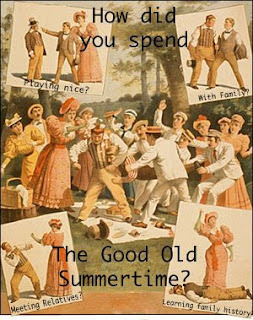 Cyndi Beane Henry presents Carnival of Genealogy - 76th Edition posted at Mountain Genealogists, saying, "My memories of summer back in "the good old days"." Becky Wiseman presents 'Twas the Summer of '59 posted at kinexxions, saying, "Counselors, hoppers, and a little homesickness. Throw in a cabin mate crying for her dog and a bit of rope burn and you have a recipe for a "fun" time at summer camp." Tami Osmer Glatz presents Nothing says summer vacation like a 6 year old with a rifle posted at relatively curious about genealogy. Tracy presents Summertime in good ol' South Dakota posted at The Pieces of My Past, saying, "Fond memories through the eyes of a six year old of a summer vacation in South Dakota that 28 years later holds poignant memories and great genealogical significance." Charles Hansen presents How I spend my Summer Vacation posted at Mikkel's Hus. Donna Pointkouski presents The Innocents Abroad posted at What's Past is Prologue, saying, "It was the worst of times, it was the best of times - it was my first real vacation!" Apple presents Carefree Summers posted at Apple's Tree, saying, "I loved the beach but my parents preferred the woods when we vacationed with a little pop-up camper." Jasia presents Oh What a Summer It Was! posted at Creative Gene saying, "1972 was a summer of many firsts for me. I traveled far and wide, learned a lot about my Polish heritage, this vast and beautiful country of ours, and boys... lots about boys!" Tonia Kendrick presents Those Lazy Hazy Days of Summer posted at Tonia's Roots, saying, ""When I think of my favorite summer memories, I don’t think of the “big” events - vacations, trips, camp, etc. It’s the soft, fuzzy memories that come to mind - the ones about family and traditions and the lazy summer days that only seem to happen when you are a kid."" Amanda presents Pies posted at A Tale of Two Ancestors. Lisa Alzo presents Carnival of Genealogy: Summer Vacation: Canada 1970? posted at The Accidental Genealogist, saying, "Carnival of Genealogy: Summer Vacation: Canada 1970?" footnoteMaven presents Summer fling, don't mean a thing, but uh-oh those summer nights! posted at footnoteMaven, saying, "As a teenager, I was a serial dater. Or so my sister likes to say of me. Hey, it was a small town. There weren't that many boys. There is, however, always one." That concludes this edition of the Carnival of Genealogy. I hope you enjoyed traveling down memory lane with us! As human beings, our very existence is proof of the survival skills, faith, or just plain luck our ancestors possessed in order to persevere through millenia of disasters: epidemics, wars, pestilences, famines, accidents, and acts of nature. For the next Carnival of Genealogy, tell about a disaster that one or more of your ancestors lived through: Did they survive a hurricane, flood, tornado, train wreck, sinking ship, plague, genocide, explosion, mine collapse, or some other terrible event? How did they survive? Research the details of the disaster and explain how it affected your ancestor (guilt, fear, faith, gratitude, etc. ), your family's history, and even yourself! Tip: Check out GenDisasters and historical newspapers to get more details about the event. The deadline for submissions for the next edition is August 1 and it will be hosted by Miriam at AnceStories. Thanks Miriam! Submit your blog article to the next edition of the Carnival of Genealogy using the carnival submission form. Please use a descriptive phrase in the title of any articles you plan to submit and/or write a brief description/introduction to your articles in the "comment" box of the blogcarnival submission form. This will give readers an idea of what you've written about and hopefully interest them in clicking on your link. And thanks for the poster, fM!